Please note that appropriate swimwear is required when using the facilities within Aquaventure. Entry to Aquaventure is free for children under 2 years old. Collection Information Please redeem tickets at Aquaventure Ticketing Plaza using your iVenture Card. If you want to journey into the very heart of excitement, go no further than Aquaventure Atlantis, the largest waterpark in the Middle East and Europe. Guests can spend the day enjoying a series of thrilling waterslides, a 2.3 kilometre tidal river, dramatic wave surges and beautiful waterfalls set amidst a tropical landscape. Aquaventure Atlantis offers a wide variety of attractions to suit all-comers, from high impact water rides to leisurely sandbanks and rest areas – the water park has it all! 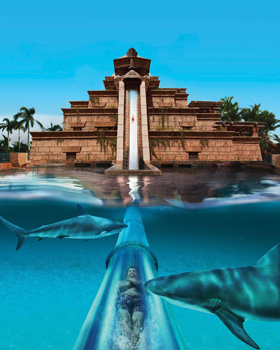 Not for the fainthearted, the exhilarating Ziggurat which at 27.5 metres high, plunges guests down the Leap of Faith, a near vertical freefall waterslide, through shark-filled waters. For quieter moments, guests can unwind on the sun-speckled beach and indulge in light snacks and refreshments from Barracudas and Shark Bites restaurants as well as the kiosks across the park. Appropriate swimwear is required when using the facilities within Aquaventure and the beach – thongs, transparent bathing suits, underwear, denim, very loose clothing such as abaya, dishdasha or similar are not permitted in the water. Headscarves, only if properly secured without any loosely flowing material. Visitors are not permitted to bring food, beverages, glassware, or alcohol into Aquaventure. There is no age restriction to enter or enjoy the park, but the children must be supervised always by a responsible adult. If your child is under the height of 48” or 1.2m, the child should be kept in arms reach of a responsible adult while in the water and are required to wear a life jacket. Life Jackets are complimentary. 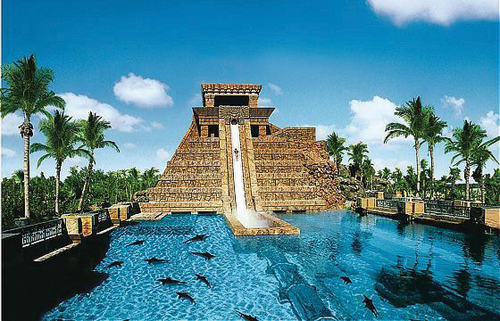 The Aquaventure Atlantis is located on the water of Dubai on an island called Palm Island. It is a close distance from Downtown Dubai if you are travelling by car but walking is not advised. Expect a 20-minute journey by car or taxi. You can also take public transportation to the station outside the Mall of Emirates which will take about 20 minutes. After getting off at the Mall of Emirates, you can then take a 10-minute taxi ride that will take you to the waterpark.